The living room is the place where you spend a part of your time, allowing yourself some rest, and where you will receive visits. Therefore it is one of the most important rooms in your home. It is in this room that you can run wild with taste and class, choosing a classic style furnishing with unmistakeable elegance. Paying attention to details, fine aesthetics, sophisticated decoration and comfort are privileges that only this style can guarantee. 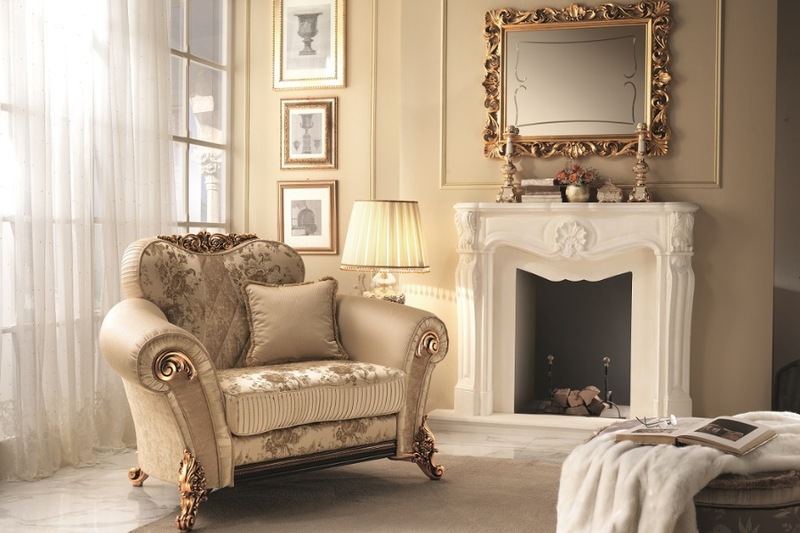 Furnishing a living room in a classic style means providing a unique touch, by creating an intimate, personal atmosphere that, in addition to wowing your guests, will also make you feel completely relaxed. Sofas, armchairs and chaises longues, change in the living room from common pieces of furniture to items of comfort and decoration. Cushions also play a central role in furnishing a living room. They are often matched to sofas and armchairs, and not only those, and have always been furnishing accessories that are the symbol of well-being and relaxation. As accessories, cushions are indispensable for enriching sofas and armchairs and lend personality to the furniture. 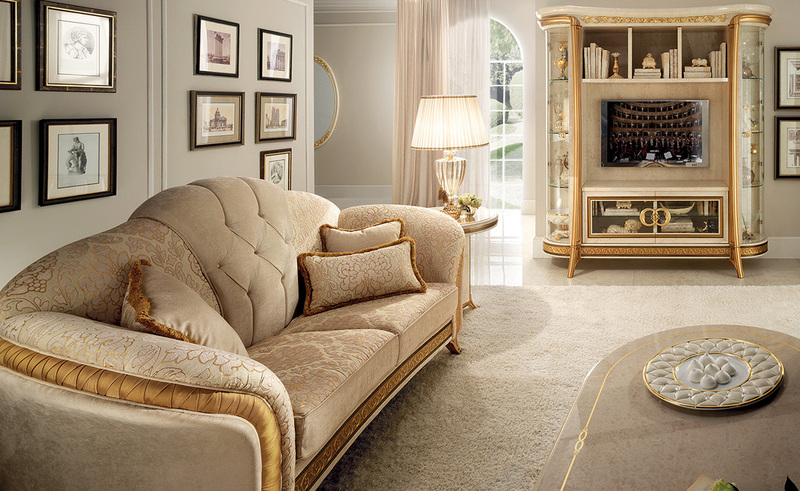 That is why their design must reflect the classic lines of the living room. While as items of comfort they must satisfy your both aesthetically and on a sensory level (visual and tactile). How can you do all this? We will show you with a few suggestions. The first two steps are simple, as you do not have to move far from the chromatic line suggested and choose minimal shapes. For the last two steps, however, the most important ones, it is necessary to first of all understand which materials and fabrics are closest to the classic style. 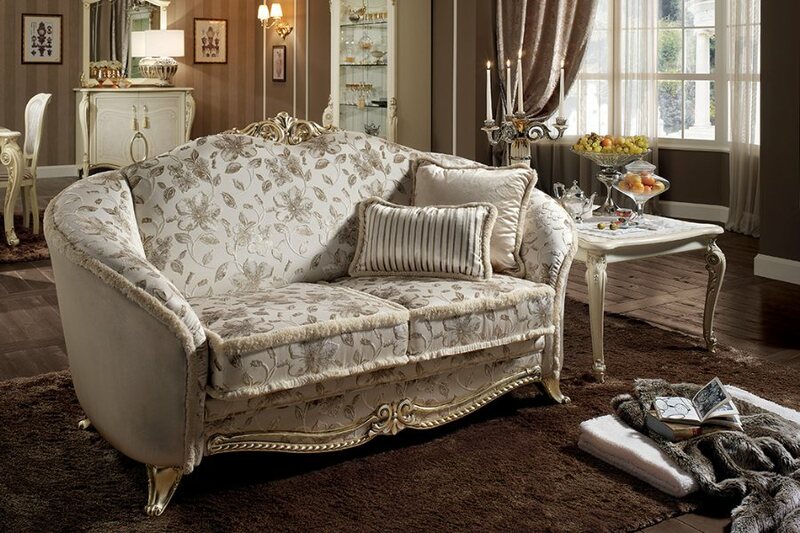 There are two types of cushions: with natural or synthetic fibres. 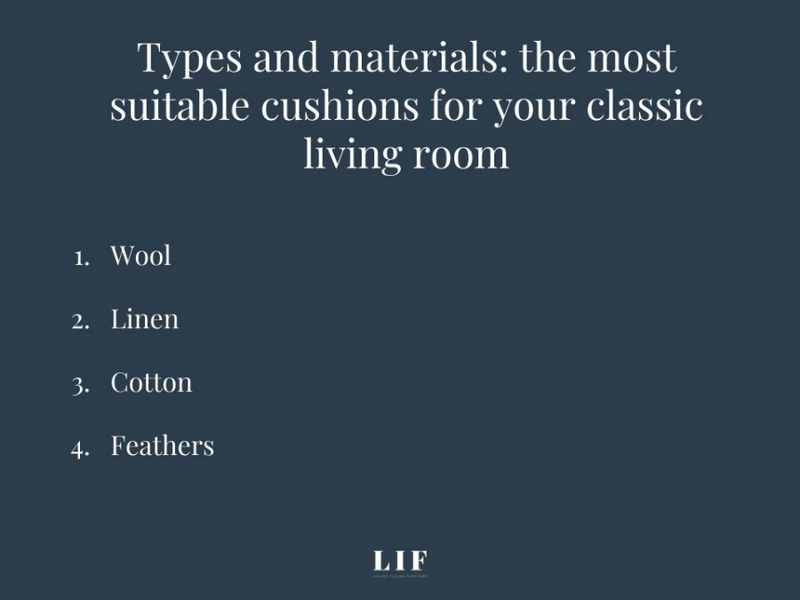 The type depends on the different materials used to create cushions. Few materials are more suited to recreate a unique, luxurious atmosphere, even starting with the smallest details. Feathers: are used for stuffing cushions, lending considerable volume and softness to the cushion. To cover your living room cushions, choose precious fabrics with warm, austere colours, with sophisticated decorations in pure classic style. Fine, high-quality characteristics for recreating a sumptuous, charming environment in every corner. Here is a selection of the finest classic fabrics for you. This is a fabric with an extremely shiny, smooth to the touch, even surface. 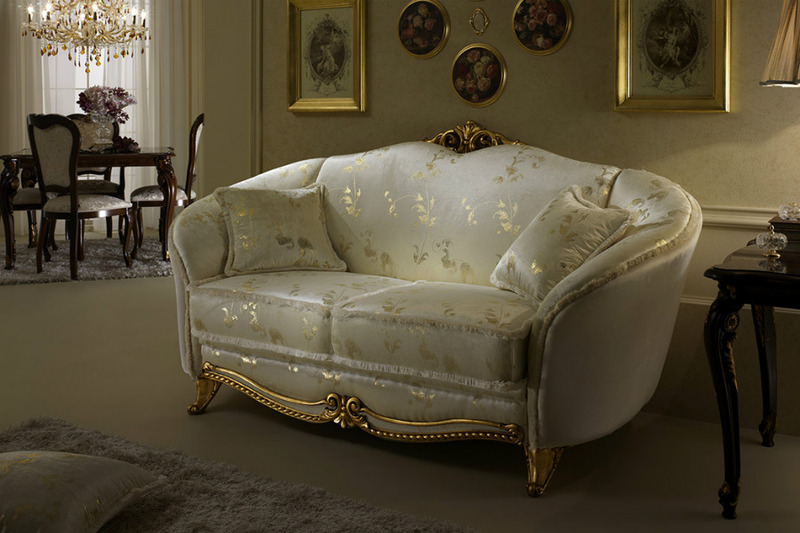 Satin, embellished with gold leaf details, covers cushions in the “Tiziano” Collection living room with floral prints that bring back to life the eternal elegance of neo-Classic style. A truly fine ornamental fabric, brocade has a smooth background, or one worked with a complex weave, with extra threads and inlays to recreate raised designs and embroidery with unique, picturesque shapes. Such an excellently made fabric captures everyone’s gaze and touch. Damask stands out for its shininess and this is why it is often confused with satin. The main difference between these fabrics lies in the use of the sides: only the shiny side of satin can be used, while both sides of damask can be used. It is, in fact, a reversible fabric, with both sides identical in the embroidery, but with opposite colouring. Lampas is similar to brocade, but is easily recognisable by the side that is not decorated which is filled with continuous tangled threads. Producing this fabric is complicated as it has two wefts and two warps. It is soft to the touch of the palm, while it shimmers with its intense colours to the eye. This is the sensation of velvet, one of the fabrics that best represents the essence of classic taste in furniture. Cushions covered with velvet covers will be perfect for recreating a sumptuous classic style environment for the living room. When placed on the corner sofa from the “Donatello” Collection we find different shaped cushions, both round and square, covered in damask velvet and gold leaf with its unmistakeable glint. Rich, refined decoration details that contribute to lending greater quality to the whole room. Sight is the first sense used to evaluate the aesthetic nature of an item of furnishing, but touch also plays an important role when choosing cushions that are suitable for a classic living room. Details make the difference and it is often possible to recognise the unmistakable features just by touching with a hand. Let's talk about the trim around a cushion, decorative elements that add uniqueness to accessories chosen for sofas and armchairs. Ruffles, fringes, double flounces and chord are fine decorative details that are essential to enrich the shape of the cushion. They frame the cushion, following simple lines and embellishing the silhouette with pieces of embroidered fabric, sewn into different, creative shapes. 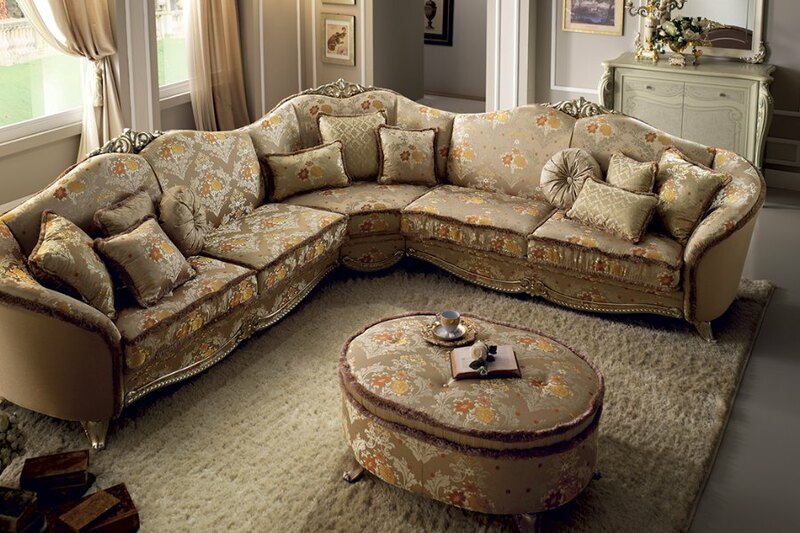 In addition to being items of comfort, cushions are important distinguishing elements for a classic living room. They lend accents to sofas and armchairs, giving the idea of a more marked sensation of welcome and warmth in the living room. Soft, comfortable...classic cushions adorned by the finery of cushions made with excellent workmanship, lending an unmistakeable sensory experience. Slipping into sleep while cradled by soft velvety caresses, taking care of friends and guests with accessories with a unique aesthetic and decorative taste: Classic Italian style. Co-founder, Marketing Manager and Sales manager, Lorena loves the elegant design of furniture and precious details. 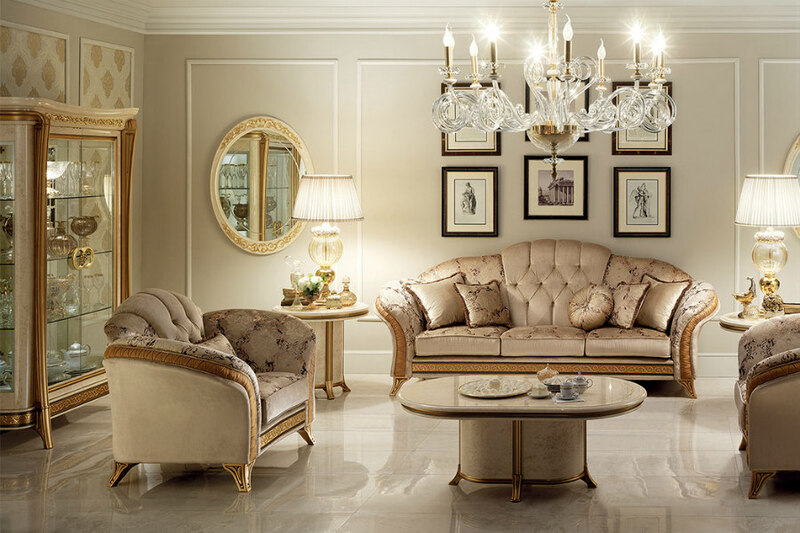 This blog is intended to be a space dedicated to luxury furniture for your home. Our intention is to suggest the most suitable styles to your personality, guiding you in the choice of the best solution.